 Why Do I Paint? Welcome to My Father's Art Gallery. There are TWO Galleries of this category and FOUR paintings in each Gallery. Now you are in Gallery ONE. Original Size 10" x 12". 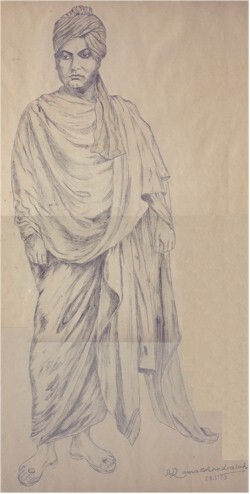 My Father drew when he was doing his B.Ed in Vijaya Teacher's college, Bangalore. This master piece had impressed everyone with no exception of his college Principal who later announced to publish the drawing on the first page of the College Souvenir every year. Later I copied the same painting in 1993 and with a little modification made it to look like Radha and Krishna. I love my father's style of drawing that shows each and every part of it in a greatest detail. Indian Ink and Water Color on Drawing Paper. Original Size 12" x 20". I still remember those days, my father was working on this in Chirala when we went to my Grandma's place for summer vacations. I was just Five Years old and my memories are still fresh. This is the only work I remember I saw my father in action when he was drawing. My uncle Jaladanki Sudhakar who is also an artist and Movie Script writer was sitting beside my father observing his work. Without doubt, it is a great master piece from his hand. Water Colors on a wall. Original Size 30" x 24". 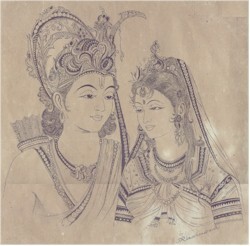 Portrait of Sita & Rama. 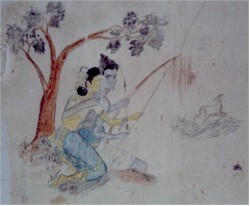 Sita asking Lord Rama to catch the Golden Deer. This was painted on a wall in the house where my Father was born. It is still being preserved on the wall by his brother in his village Damaramadugu, Nellore District, AP, India. My father was Thirteen years old when he drew this. I tried to capture his great work with my camera. One of his two earliest drawings I could ever get to see and preserve. Original Size 16" x 24". Portrait of Lord SriRama. 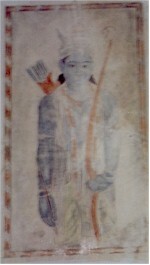 A Traditional portrait of Lord Rama alone with his mighty weapons Bow and Arrows. This was also painted on a wall in the house where my Father was born. It is still being preserved on the wall by his brother in his village Damaramadugu, Nellore District, AP, India. My father was Thirteen years old when he drew this. I tried to capture his great work with my camera. "Art is writing a dissertation and only letting people see the last line of the conclusion." -?? ?